BrookfieldAngler.com: Fishing Grips - Are they really that bad? Fishing Grips - Are they really that bad? In interest of full disclosure, I am on Lucid Fishing's prostaff and Lucid fishing grips are one of their flagship products. Please realize though, that I jumped on with them because I like what they are trying to do in bringing a product that rivals the quality of the main player in grips - Boga Grips - at a price that the average person can actually afford. Also, let's be real about the practical uses for a fishing grip. They are not a tool that should be considered the best option in every situation. Period. Do you need them to catch a bass, trout, or a bonefish? Not really. As a matter of fact - and I am sure that Lucid Fishing is going to be really mad at me for saying this - if you can't lip a bass or hold a small trout in your hand, you need to man up (please remember to wet your hands before touching a fish to protect its slime coat). Unless you are a young girl, you have no excuses. Is it easier to land a fish with a grip than a net? Not always. So what's the point of them? To those who use them, myself included, they are a tool to help control a fish in various situations. If I am wading for toothy fish like pike or walleye, they are much easier to carry than a net. They also help keep my hand away from the teeth of these fish. People who fish saltwater are probably the biggest users of them since just about every fish that swims in the ocean has teeth. (OK maybe not all of them but a lot). Kayak anglers are also a big segment of the market because the limited deck space on a kayak forces you downsize and minimize what you have on you. I have tried the net thing on a kayak and will pretty much never do it again. Between wind catching it like a sail, its inevitable ability to grab your lure or fly's hook(s), or the awkward task of reaching for it behind you when you have a fish on the line, it's a nightmare. To me, this is where I REALLY love having my Lucid Grips. They can attach to my seat and be there at a moments notice when I need them. They don't take up much space and they never become a hook trap. The two other reasons I use them is for the sake of controlling a fish once I have already landed it the net and releasing it - especially when the water is super cold. When you land a fish and are trying to get the hook(s) out of its mouth, you are just begging to become hooked yourself. When that fish starts going nuts, as they do so very often, and your fingers are on that fly or lure, you have no real choice but to get your hands out of the way and let the fish do its thing. This does nothing but delay the release of your worthy adversary. By using your grips, you can control the fishes head which means that it is less likely to hook you or get more tangled in the net. Have you ever landed a fish with a lure that has multiple hooks like a crankbait? What happens when that fish thrashes? The hooks get caught in the net and creates a really bad mess. I will admit that this is where rubberized nets really shine compared to the string nets but that's not to say tangles don't still happen. A great example of this usage came this past weekend of epic musky catching on the fly! All musky hooked and landed were done so with the use of an expensive Frabil net. We were in a boat, had plenty of space, and it was the fastest way to make sure the fish were landed. Now, I can't tell you how many musky I have caught that go nuts in the net with monster treble hooks hanging out of its mouth from the huge lures that are typically used to catch musky. After they are netted, I usually spend another couple of minutes with its head out of the water trying to untangle the mess caused by their gator roll. These are a couple more minutes that the fish has to wait to be released after a hard fought battle. As you can see in the video below, I actually used my Lucid Grips to control the fishes head after it was netted which kept it from getting tangled and allowed me to get that fish swimming much faster. Now, let's get to all the "experts" who have something to say about how bad grips are. I have heard/read just about every criticism in the world about "how bad Boga Grips" are for fish and how unethical they are. I have scoured the internet and recalled on some conversations to come up with this list of objections...Time to tackle this nonsense! 1. "They will shred or break the break the fishes jaw when the fish rolls or thrashes"
Anyone who says this has obviously never used a quality set of grips like Lucid's or even Boga's. These grips are designed to prevent that exact thing with a very smooth and free spinning swiveling head. If the fish starts rolling, the head of the grips does as well so absolutely no damage is done to the fish. The lesson here is to make sure you buy a quality grip. If you don't want to pony up the $100+ for the Bogas, the Lucid Grips are just as good and just as durable at less than half the price. 2. "The jaws of the grip puts a hole in the fishes mouth"
A-See point 1. B-So does a hook! If you are really that worried about not putting a hole in a fishes mouth or tongue or hurting it in anyway at all, perhaps you should join PETA and stop fishing. I have never seen a hole any bigger than the hole a hook makes after a catch when using my grips. 3. "They cause the fish to support all of its weight by its jaw"
Well, unless you are missing your second arm for some reason, there is this amazingly simple action of using your other hand to support the belly on the fish. Stupid handling isn't caused by grips...it's caused by stupid ignorant people. The same problem exists if you are holding a fish by its lips or gills. The lesson - don't hold the fish vertically. AKA...use some common sense. 4. This next quote really applies to arguments 2 and 3 above. "If you want to test the boga grip thing, have a bunch of your buddies over some night - have three of them lock vice grips to your lower lip and then lift you off the ground." Good idea! Let's make sure it's really accurate and have him try to run in the other direction with a hook in his mouth while you are trying to reel him in, too! I mean, if you're going to try and experience what it's like to be a fish, then let's do the whole thing! 5. "It keeps the head out of the water for too long"
Uhmm....then put its head back in the water for a minute and let the damn fish breathe. The nice thing is that a Lucid Fishing Grip is about 8" long so you can let the fish breathe without having to stick your hand into the water when it's really cold. Yaaay for warm hands! 6. 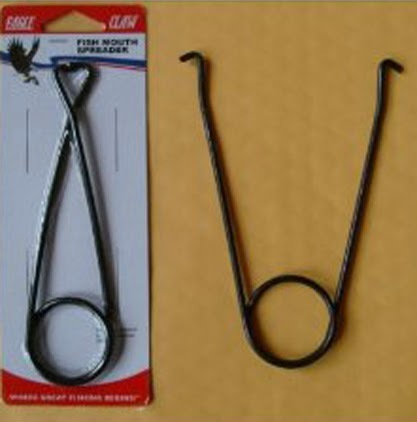 When fishing for musky, it is recommended by some that a better tool than grips would be a jaw spreader. This suggestion came right after the same person suggested that grips are bad because they put a hole in the fishes mouth...Uhmmmmmmm......really? Have you seen a jaw spreader before? Of course, I am sure that there are some much better made jaw spreaders than those. If you do use them, please get the better ones. 7. "The safest way is to never take the fish out of the water and do a quick release"
Well of course it is, Gandhi! The problem with that theory is that people like pictures. It captures a moment, triggers a memory, is a source of showing a fish you are proud of to family, friends, and the rest of the world thanks to the internet. If you don't care about that, then by golly, you are a better man than me. Please go back to you zen thing. I will argue, though, that the actual safest way to make sure you do no harm to a fish is to not catch it all. ....just saying. I suppose my real questions/challenges to that study are as follows. - Why are you using grips on a bone fish? Please revert back to the "manning up" statement earlier. - What kind of grips were used? Were they the cheap ones (made by Rapala or Berkley as an example) where the head either doesn't swivel at all or barely swivels because of crappy manufacturing/materials? -Of course there was damage done to the fish that were held vertically in the air. It doesn't take a scientist to tell you this is a bad idea. I've already covered the rest of that response in earlier points. 9. "The plastic lips grippers are better - plus they float and are cheaper"
Let's look at this one....My response is simple - God help that fish if it decides to roll or thrash. No swivel head means sore jaw. The floating thing is cool though. 10. "...and Bogas are just plain expensive"
Ok. I'll give you that one. In case you didn't know this was coming, can I recommend Lucid Fishing Grips instead? You can buy them here. "When handling the fish, make sure that you do not put your fingers into the gills. The fish can survive if it begins to bleed slightly from the gills, but its chances of surviving major gill damage are slim. You do NOT ever want to drop the fish. And the most important thing is to stay clear of the actual GILLS on the inside. ( the soft red feathery rakers are the GILLS, and is how they absorb oxygen from the water). you do NOT want to get you fingers into or damage the (red) gills at all. larger fish when held by the gill cover should be supported with your other hand, so be in better control and hold some of the weight. Now, how many anti-grip people have done exactly what the Illinois and Maryland DNR just clearly said not to do? I don't have any statistics on this one but I would be willing to bet that the overwhelming majority of them have. So what's the point in all of this? Very simply to stop jumping on a damn bandwagon just because you read it somewhere. If anyone has ever gone to college, they should know that one of the biggest lessons learned is to think critically. Unfortunately, it seems that most people come up with these absurd conclusions without ever really taking the time to thing about something or to research it. Boga grips, Lucid Grips, jaw spreaders, giant treble hooks, pliers, nets, etc...are not bad things by themselves. It's the users poor handling and decisions that make them bad. Luckily the one and only time I ever had to use jaw spreaders was pike fishing in Canada. The fish never seemed worse for wear. I think my husband would use those. Thanks for sharing. A boga style grip is much better. It holds the fishes mouth open, controls the fishes movement and also allows them to stay submerged in teh water. The whole time your other arm is free to remove the fly. Many also have a scale built into the shaft to weigh the catch at the same time. Cool blog man. I am a first time visitor. Love the Muskie stuff and love my Boga. Keep up the good work and tight lines! Thanks for the visit and comment!! Hope it's not the last! You call people stupid and ignorant for not supporting a fish's weight with their other hand, but the product that you're endorsing encourages them to do that by including a scale. How the hell are you supposed to weigh the fish while we're supporting half its weight with our other hand? I guess you could put it in a sack and hang the sack from the grip, but that's pretty inconvenient, and it clearly isn't what the manufacturer intends. Also depending on the net, I have notice that nets tends to damage the fins and tails of the fish I am planning to release which lower its survival rate. This post might be a year old, but its new to me and I'm planning on getting a fish grip in the near future. Holding a bass horizontal by it's lip is bad, I don't think holding it vertical for a short time is going to hurt it. They are not as fragile as some people think.